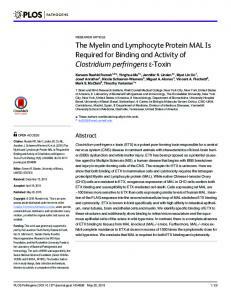 May 20, 2015 - Therefore, we sought to test the hypothesis that MAL is the ETX receptor. ... CHOGFP cells, we designed an assay using PrestoBlue as a cell. rafts.21 According to the cellular context and local environment. (lipid-raft), PrPC interacts ..... Gupton SL, Gertler FB. Integrin signaling switches ... Miele G, Alejo Blanco AR, Baybutt H, Horvat S, Manson J, Clinton M. Embryonic activation and . process6,9,10. The stromal domain of Tic110 and Hip/Hop domain .... with full-length LTD (ltdcom) plants grown on ms plates containing 3% sucrose for 3 weeks. 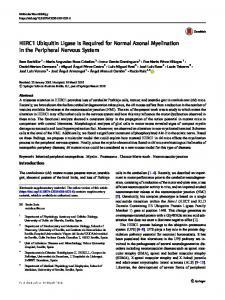 ...... incubated with 8 Âµl precursor in 100 Âµl import buffer supplemented with up to. that formation of a normal compact myelin sheath is required for normal ...... Lanterman incisures is more than doubled in shiverer PNS myelin sheaths. of January 31, 2017. This information is current as. Autoimmune Encephalomyelitis. Glycoprotein-Induced Experimental. Relapses in Myelin Oligodendrocyte. list glial functions variously as providing structural support for ... and Martha Stokely for technical support. ..... two-sample t test using Data Desk software. 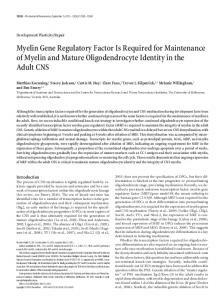 of MRF within the adult CNS is critical to maintain mature oligodendrocyte identity and the ... oligodendrocytes, it is required for the expression of myelin genes. Aug 9, 2012 - Tracy O'Connor*, Nathalie Frei, Jana Sponarova, Petra Schwarz, Mathias ...... BlÃ¤ttler T, Brandner S, Raeber AJ, Klein MA, VoigtlÃ¤nder T, et al. Apr 22, 2005 - transmembrane proteins.14,15 BAR and BI-1 do not directly interact with ... clone JG1), anti-b-actin (clone AC-15) and monoclonal antibodies. Apr 22, 2005 - Red (DTR) comicroinjected to mark the injected cells aggregates ...... Deckwerth TL, Elliott JL, Knudson CM, Johnson Jr EM, Snider WD and. Korsmeyer .... Lipscomb EA, Sarmiere PD and Freeman RS (2001) SM-20 is a novel. roots). Axon morphometry showed that large fibers were predominantly affected (Fig. 1c). Identical pathologies were detected in sciatic nerves of Prnpo/o mice on a B6/129Sv hybrid background (data not shown), Prnpo/o mice backcrossed to Balb/c mice for >17 generations (Fig. 1a), PrnpEdbg/Edbg mice (inbred 129/Ola; n = 6, Fig. 1a), PrnpEdbg/Edbg backcrossed to C57Bl/6 mice for > 8 generations (n = 2, data not shown), and PrnpGFP/GFP mice carrying a targeted substitution of Prnp with enhanced green fluorescent protein (EGFP) 11 (n = 3; Fig. 1a). No signs of neuropathy were detected in age- and strain-matched wild-type mice (C57Bl/6, B6/129Sv, Balb/c, 129/Ola; Fig. 1 and data not shown). Genetic reintroduction of PrPC via crosses to tga20 mice12 (n = 3), or introduction of one hemizygous Prnp allele (n = 4), fully prevented the polyneuropathy (Fig. 1a,c). Overexpression of the PrP paralog Dpl induces neurodegeneration in certain Prnp−/− strains13, but Dpl can partly compensate for loss of function in Prnp−/− mice13. To uncover any potential contribution of Dpl to the CDP, we investigated Prno/o mice lacking both Prnd (the gene for Dpl) and Prnp14. The ultrastructural features of the CDP in 60-week-old Prno/o mice were similar to those of Prnpo/o mice, whereas mice selectively lacking Prnd15 showed normal sciatic nerve morphology (Supplementary Fig. 1). In contrast to what we found for PrnpNgsk/Ngsk mice, we did not detect any Prnd mRNA in sciatic nerves of Prnpo/o mice (Supplementary Fig. 1). CD68 immunostaining highlighted macrophages ingesting myelin debris of degenerating nerve fibers (‘digestion chambers’). These were significantly more prevalent in sciatic nerves of 10-, 30- and 60-week-old Prnpo/o mice than in those of age-matched wild-type mice (Fig. 1b,d), indicating that the onset of polyneuropathy was much earlier than had previously been understood. Figure 1 Peripheral polyneuropathy in Prnpo/o mice. (a) Toluidine blue–stained semithin cross sections of sciatic nerves of wild-type (Balb/c and 129/Ola wt), Prnpo/o (Balb/c), Prnp+/− (Balb/c), tga20 (B6/129Sv), PrnpEdbg/Edbg (129/Ola) and PrnpGFP/GFP (C57Bl/6) mice, all around 60 weeks of age. (b) CD68immunostained longitudinal sections of sciatic nerves. More digestion chambers with macrophages and myelin debris are visible in Prnpo/o (Balb/c) than in wild-type (Balb/c) nerves at 60 and 10 weeks of age, respectively. (c) Axonal density within nerves (number of axons per mm2) was quantified morphometrically and plotted against the cross-sectional areas (µm2) of axons (axonal density-size distribution). Error bars, s.e.m. (d) Quantification shows significantly more digestion chambers in sciatic nerves of 30- and 60-week-old Prnpo/o mice than in wild-type mice. All scale bars are 50 µm. 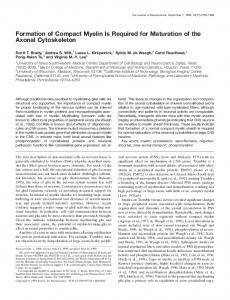 a r t ic l e s Figure 2 Ultrastructural alterations in Prnpo/o sciatic nerves. (a–h) Electron microscopy of sciatic nerves of 60-week-old Prnpo/o (b–f,h) and wild-type (a,g) mice (both Balb/c). Crosssections of wild-type nerves show normally myelinated nerve fibers (a) and regular unmyelinated axons in Remak bundles (R) (a,g). Cross-sections of Prnpo/o nerves show thinly myelinated axons, surrounded by onion bulb formations (arrows) (b,c), axon (A) surrounded by Schwann cell with prominent rough endoplasmic reticulum (arrow) and increased density of other organelles (d), as well as loss of unmyelinated axons in Remak bundles. Schwann cells ensheathing unmyelinated axons (A) frequently show abnormal branching of cytoplasmic processes (arrows) (h). Longitudinal sections of Prnpo/o nerves reveal macrophages (M) within the axon-glia interface (f) and focally folded myelin (white arrows) in the vicinity of a node of Ranvier (black arrow; e). The right internode shows thinner myelin than the left one, indicating de- and remyelination. Scale bars: a,b, 8 µm; c–h, 5 µm. Figure 3 Electrophysiology and behavior of Prnpo/o mice. 1 1 2 2 1 1 2 2 1 1 2 2 (a) NCVs were significantly reduced in Prnpo/o mice at 11 weeks (33.0 ± 3.5 m s−1 (Prnpo/o) versus 42.3 ± 4.4 m s−1 (wild type)), Hot plate test Grip strength test at 28 weeks (37.5 ± 1.5 m s−1 (Prnpo/o) versus 50.5 ± 2.8 m s−1 n.s. n.s. n.s. P = 0.002 P = 0.014 P = 0.036 70 (wild type)) and at 53 weeks (25.1 ± 0.87 m s−1 (Prnpo/o) versus 1.25 60 54.2 ± 5.6 m s−1 (wild type)). (b) FWLs were only marginally 1.00 50 increased in Prnpo/o mice at 11 weeks (5.6 ± 0.5 ms (Prnpo/o) versus 0.75 40 5.1 ± 0.4 ms (wild type)) and 28 weeks (4.2 ± 0.2 ms (Prnpo/o) versus 30 0.50 4.0 ± 0.3 ms (wild type)), but were significantly prolonged at 53 weeks 20 0.25 (6.0 ± 0.5 ms (Prnpo/o) versus 4.4 ± 0.4 ms (wild type)). (c) Prnpo/o 10 0 0 mice showed no difference in performance on the rotarod test when Age (weeks): 12 12 30 30 60 60 Age (weeks): 12 12 30 30 60 60 compared to wild-type mice at 12, 30 and 60 weeks of age. There was Prnp: +/+ o/o +/+ o/o +/+ o/o Prnp: +/+ o/o +/+ o/o +/+ o/o some training effect, as both groups showed slightly longer latencies o/o to fall in test 2, two days after test 1. (d) Hot plate test performance was significantly worse at 60 weeks in Prnp mice. (e) Prnpo/o mice showed significantly lower grip strength at 12 and 60 weeks. All mice were kept in the Balb/c background. Figure 4 Expression of by neurons is essential for myelin sheath maintenance. (a,b) Prnp mRNA and PrPC protein content of tgNSE-PrP and tgPLP-PrP sciatic nerves were investigated by western blot (a) and by real-time PCR (b; values on ordinate are normalized against wild-type mRNA). (c) Normal FWL in 35-week-old tgNSE-PrP mice (4.1 ± 0.09 ms (tgNSE-PrP) and 4.2 ± 0.2 ms (wild type)) and prolonged latencies in age-matched B6/129Sv Prnpo/o (4.5 ± 0.2 ms) and tgPLP-PrP mice (4.3 ± 0.2 ms). (d) Quantification of cumulative axonal density-size distribution indicates nearly normal distribution in tgNSE-PrP mice and reduced large-axon density in Prnpo/o and tgPLP-PrP mice. Error bars, s.e.m. (e) PrPC localization was studied by immunofluorescence. (f,g) Semithin sections of nerves from 60-week-old tgNSE-PrP and tgPLP-PrP mice stained with toluidine blue. (h) Percentage of fibers with g-ratio > 0.81 and onion bulb formation in wild-type, Prnpo/o, tgNSE-PrP and tgPLP-PrP mice. Error bars, s.d. Figure 5 Neuron-specific but not Schwann cell–specific depletion of PrPC induces polyneuropathy. Prnpo/o mice carrying a loxP-flanked Prnp transgene, termed tgPrnploxP, were crossed to tgNFH-Cre expressing Cre in neurons or to tgDhh-Cre expressing Cre in Schwann cells. (a–h) Morphological analysis of sciatic nerves at 60 weeks of age. (b) Toluidine blue-stained semithin sections showing CDP in tgPrnploxP × tgNFH-Cre mice with neuronal PrPC depletion. (e) Electron microscopy showing onion bulb formation in a tgPrnploxP × tgNFHCre mouse. (a,c,d,f) By contrast, tgPrnploxP on a Prnpo/o background and tgPrnploxP × tgDhh-Cre showed normal morphology of sciatic nerves in semithin sections (a,c) and electron microscopy (d,f). Scale bars: a, 50 µm; d–f, 2 µm. (g) Quantification of cumulative axonal density-size distribution showing reduction of large axons in tgPrnploxP × tgNFH-Cre as in Prnpo/o nerves. Error bars, s.e.m. (h) Percentage of fibers with g-ratio > 0.81 and onion bulb formation in tgPrnploxP × tgNFH-Cre mice was significantly increased compared to tgPrnploxP × tgDhh-Cre and tgPrnploxP mice. Error bars, s.d. (i–l) Expression of Prnp mRNA was analyzed by in situ hybridization in 60-week-old tgNFH-Cre and tgPrnploxP × tgNFH-Cre mice using a Prnp antisense probe. TgPrnploxP mice express Prnp in dorsal root ganglia (i) and spinal cord neurons (j). Dashed line: border between spinal white and gray matter. Scale bars: i, 200 µm; j, 500 µm. After recombination, Prnp was undetectable in ~70% of DRG (k) and in all spinal cord neurons (l). (m) Western blot of PrPC expression in tgPrnploxP mice and following conditional depletion of Prnp. Samples were treated with PNGase or left untreated; antibody: POM1. Genomic analyses We analyzed DNA short tandem repeats (STRs) in 37 mice for the presence of mouse strain–specific polymorphisms that could ­contribute to the observed phenotypes. Twenty-two STRs covered chromosome 2 (on which Prnp resides) and 184 STRs covered the rest of the genome. We were unable to identify any genetic association other than Prnp that would explain the CDP phenotype. The genetic markers not flanking the Prnp locus were similar in mice with and without neuropathy. This was true for mice on the mixed background B6/129Sv (tgNSE-PrP, Prnpo/o, tgPLP-PrP, tgDelC4, tgPrP∆CC, tgF35) and for mice on FVB (tgPrnploxP, tgPrnploxP × tgNHF-Cre, tgPrnploxP × tgDhh-Cre; Supplementary Fig. 9). When comparing wild-type and Prnpo/o mice on the Balb/c background, STR polymorphisms delineated a genomic region of ~14 cM segregating with the Prnpo allele and CDP. As this region was preserved in Prnpo/o mice whose neuropathy was suppressed by an unlinked Prnp transgene (for example, tgNSE-PrP), it is unlikely that it determined the CDP phenotype (Supplementary Figs. 10–12). PNGase – PNGase + PNGase + Figure 6 PrPC expression and proteolytic processing in sciatic nerves of wild-type and tgGPI−PrP mice. 37 Western blot analysis comparing PrPC protein expression in the sciatic nerve with that in the brain of wild25 type mice, using two different monoclonal antibodies, POM1 and POM3, for detection. (a) After PNGase 20 treatment of protein lysates, two bands were recognized by POM3 antibody, whereas POM1 detected three 15 bands. (b) This band pattern is explained by the localization of antibody epitopes and by the existence of β-actin three PrP isoforms, each containing an intact C terminus: full-length PrP, C2 fragment and C1 fragment. (c) TgGPI−PrP mice were analyzed for PrP expression with POM11 antibody, before and after PNGase treatment in comparison to serially diluted Prnp+/− sciatic nerve lysates. (d) For analysis of PrP processing, we used antibody POM1 which detects all holo-PrP C and all C-terminal fragments. 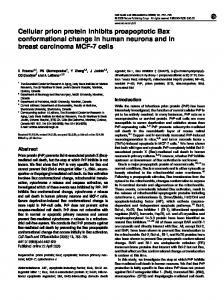 POM1 detected GPI−PrP to a lesser extent than POM11. However, no formation of C-terminal fragments was observed, even after very long exposures (right). The combined results of restricting expression of PrPC to neurons and of selectively depleting PrPC from neurons indicate that the expression of PrPC by neurons is essential for the long-term integrity of peripheral myelin sheaths. Not only was the trophic function of PrPC exerted in trans, but it also correlated with the proteolytic processing of PrPC in diverse transgenic mouse models. These findings identify PrPC as a critical messenger of transcellular axomyelinic communication and indicate that regulated proteolysis of axonal PrPC might expose domains that interact with Schwann cell receptors. Clarifying the molecular basis of these phenomena might lead to a better understanding of peripheral neuro­ pathies—particularly those of late onset—and might help to uncover new therapeutic targets for these common, debilitating disorders. Methods Methods and any associated references are available in the online version of the paper at http://www.nature.com/natureneuroscience/. Note: Supplementary information is available on the Nature Neuroscience website. Acknowledgments We thank M. Delic, R. Moos, D. Goriounov, C. Tostado, H. Mader, K. Nairz, M. Bieri, N. Wey and D. Meijer for methodological advice and technical help. G. Mallucci provided tgNFH-Cre and tgPrnploxP mice, D. Meijer provided tgDhh-Cre mice, J.C. Manson provided PrnpEdbg/Edbg mice, J. Collinge provided Prnpo/o FVB mice, S. Lindquist and W. Jackson provided PrnpGFP/GFP mice and P. Saftig and A. Rittger provided nerves from BACE1−/− mice. We thank W.B. Macklin for the PLP plasmid; T. Rülicke for pronuclear injections and H. Welzl, I. Drescher and S. Wirth for help with behavioral tests. J.A. Girault and M.T. Dours-Zimmermann donated anti-paranodine/ Caspr and anti-versican antibodies, respectively. We thank B. Seifert for statistical consulting. A.A. received an ERC Advanced Investigator Grant and grants from the European Union (PRIORITY and LUPAS), the Novartis Foundation and the Swiss National Foundation. J.B. received a Career Development award from the University of Zürich. C.W. and K.V.T. were supported by the Departmental Research Fund. AUTHOR CONTRIBUTIONS J.B. and A.A. designed the study and wrote the manuscript. J.B., F.B., C.T., C.W., H.F., P.S., A.D.S., K.V.T. and J.W. did the experiments. J.B., F.B., C.T., C.W., H.F., A.D.S., K.V.T., K.-A.N., J.W. and A.A. analyzed the data. COMPETING INTERESTS STATEMENT The authors declare no competing financial interests. Published online at http://www.nature.com/natureneuroscience/. Reprints and permissions information is available online at http://www.nature.com/ reprintsandpermissions/. 1. Aguzzi, A., Baumann, F. & Bremer, J. The prion’s elusive reason for being. Annu. Rev. Neurosci. 31, 439–477 (2008). 2. 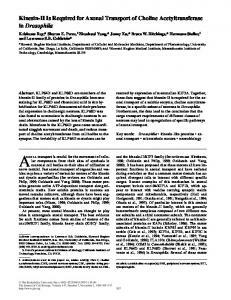 Brandner, S. et al. Normal host prion protein necessary for scrapie-induced neurotoxicity. Nature 379, 339–343 (1996). 3. Laurén, J., Gimbel, D.A., Nygaard, H.B., Gilbert, J.W. & Strittmatter, S.M. Cellular prion protein mediates impairment of synaptic plasticity by amyloid-beta oligomers. Nature 457, 1128–1132 (2009). 4. Büeler, H. et al. Normal development and behavior of mice lacking the neuronal cell-surface PrP protein. Nature 356, 577–582 (1992). 5. Lledo, P.M., Tremblay, P., Dearmond, S.J., Prusiner, S.B. & Nicoll, R.A. Mice deficient for prion protein exhibit normal neuronal excitability and synaptic transmission in the hippocampus. Proc. Natl. Acad. Sci. USA 93, 2403–2407 (1996). 6. Collinge, J. et al. 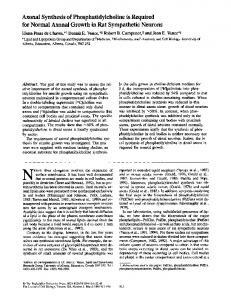 Prion protein is necessary for normal synaptic function. Nature 370, 295–297 (1994). 7. Mallucci, G.R. et al. Postnatal knockout of prion protein alters hippocampal CA1 properties, but does not result in neurodegeneration. EMBO J. 21, 202–210 (2002). 8. Nazor, K.E., Seward, T. & Telling, G.C. Motor behavioral and neuropathological deficits in mice deficient for normal prion protein expression. Biochim. Biophys. Acta 1772, 645–653 (2007). 9. Steele, A.D., Lindquist, S. & Aguzzi, A. The prion protein knockout mouse: a phenotype under challenge. Prion 1, 83–93 (2007). 10. Nishida, N. et al. A mouse prion protein transgene rescues mice deficient for the prion protein gene from Purkinje cell degeneration and demyelination. Lab. Invest. 79, 689–697 (1999). 11. Heikenwalder, M. et al. Lymphotoxin-dependent prion replication in inflammatory stromal cells of granulomas. Immunity 29, 998–1008 (2008). 12. Fischer, M. et al. Prion protein (PrP) with amino-proximal deletions restoring susceptibility of PrP knockout mice to scrapie. EMBO J. 15, 1255–1264 (1996). a r t ic l e s 13. Moore, R.C. et al. Ataxia in prion protein (PrP)-deficient mice is associated with upregulation of the novel PrP-like protein doppel. J. Mol. Biol. 292, 797–817 (1999). 14. Genoud, N. et al. Disruption of Doppel prevents neurodegeneration in mice with extensive Prnp deletions. Proc. Natl. Acad. Sci. USA 101, 4198–4203 (2004). 15. Behrens, A. et al. Absence of the prion protein homologue Doppel causes male sterility. EMBO J. 21, 3652–3658 (2002). 16. Ogata, T. et al. Opposing extracellular signal-regulated kinase and Akt pathways control Schwann cell myelination. J. Neurosci. 24, 6724–6732 (2004). 17. Radovanovic, I. et al. Truncated prion protein and Doppel are myelinotoxic in the absence of oligodendrocytic PrPC. J. Neurosci. 25, 4879–4888 (2005). 18. Prinz, M. et al. Intrinsic resistance of oligodendrocytes to prion infection. J. Neurosci. 24, 5974–5981 (2004). 19. Polymenidou, M. et al. The POM monoclonals: a comprehensive set of antibodies to non-overlapping prion protein epitopes. PLoS One 3, e3872 (2008). 20. Watt, N.T. & Hooper, N.M. Reactive oxygen species (ROS)-mediated beta-cleavage of the prion protein in the mechanism of the cellular response to oxidative stress. Biochem. Soc. Trans. 33, 1123–1125 (2005). 21. Mangé, A. et al. Alpha- and beta- cleavages of the amino-terminus of the cellular prion protein. Biol. Cell 96, 125–132 (2004). 22. Chesebro, B. et al. Anchorless prion protein results in infectious amyloid disease without clinical scrapie. Science 308, 1435–1439 (2005). 23. 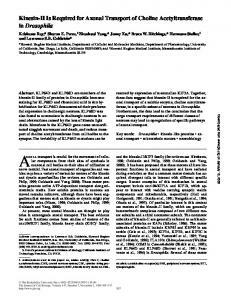 Shmerling, D. et al. Expression of amino-terminally truncated PrP in the mouse leading to ataxia and specific cerebellar lesions. Cell 93, 203–214 (1998). 24. Mouillet-Richard, S. et al. Signal transduction through prion protein. Science 289, 1925–1928 (2000). 25. Schneider, B. et al. NADPH oxidase and extracellular regulated kinases 1/2 are targets of prion protein signaling in neuronal and nonneuronal cells. Proc. Natl. Acad. Sci. USA 100, 13326–13331 (2003). 26. Toni, M. et al. Cellular prion protein and caveolin-1 interaction in a neuronal cell line precedes fyn/erk 1/2 signal transduction. J. Biomed. Biotechnol. 2006, 69469 (2006). 27. Chen, S., Mange, A., Dong, L., Lehmann, S. & Schachner, M. Prion protein as trans-interacting partner for neurons is involved in neurite outgrowth and neuronal survival. Mol. Cell. Neurosci. 22, 227–233 (2003). 28. Santuccione, A., Sytnyk, V., Leshchyns′ka, I. & Schachner, M. Prion protein recruits its neuronal receptor NCAM to lipid rafts to activate p59fyn and to enhance neurite outgrowth. J. Cell Biol. 169, 341–354 (2005). 29. Meotti, F.C. et al. Involvement of cellular prion protein in the nociceptive response in mice. Brain Res. 1151, 84–90 (2007). 30. Nico, P.B. et al. Altered behavioral response to acute stress in mice lacking cellular prion protein. Behav. Brain Res. 162, 173–181 (2005). 31. Liu, T. et al. Intercellular transfer of the cellular prion protein. J. Biol. Chem. 277, 47671–47678 (2002). 32. Nave, K.A. & Trapp, B.D. Axon-glial signaling and the glial support of axon function. Annu. Rev. Neurosci. 31, 535–561 (2008). 33. Britsch, S. The neuregulin-I/ErbB signaling system in development and disease. Adv. Anat. Embryol. Cell Biol. 190, 1–65 (2007). 34. Parkin, E.T. et al. Cellular prion protein regulates beta-secretase cleavage of the Alzheimer′s amyloid precursor protein. Proc. Natl. Acad. Sci. USA 104, 11062–11067 (2007). 35. Hu, X. et al. Bace1 modulates myelination in the central and peripheral nervous system. Nat. Neurosci. 9, 1520–1525 (2006). 36. Willem, M. et al. Control of peripheral nerve myelination by the beta-secretase BACE1. Science 314, 664–666 (2006). 37. Rutishauser, D. et al. The comprehensive native interactome of a fully functional tagged prion protein. PLoS One 4, e4446 (2009). 38. Baumann, F. et al. Lethal recessive myelin toxicity of prion protein lacking its central domain. EMBO J. 26, 538–547 (2007). 39. McMahon, H.E. et al. Cleavage of the amino terminus of the prion protein by reactive oxygen species. J. Biol. Chem. 276, 2286–2291 (2001). 40. Sunyach, C., Cisse, M.A., da Costa, C.A., Vincent, B. & Checler, F. The C-terminal products of cellular prion protein processing, C1 and C2, exert distinct influence on p53-dependent staurosporine-induced caspase-3 activation. J. Biol. Chem. 282, 1956–1963 (2007). 41. Walmsley, A.R., Watt, N.T., Taylor, D.R., Perera, W.S. & Hooper, N.M. Alpha-cleavage of the prion protein occurs in a late compartment of the secretory pathway and is independent of lipid rafts. Mol. Cell. Neurosci. 40, 242–248 (2009). 42. Isaacs, J.D., Jackson, G.S. & Altmann, D.M. The role of the cellular prion protein in the immune system. Clin. Exp. Immunol. 146, 1–8 (2006). that allowed us to determine the force at which the mice released their grip. We tested grip strength five times in a row with 2-min intervals between trials. For the accelerating rotarod test, we placed the mice on a rotating rod with a speed slowly accelerating from 4 to 40 r.p.m. (Ugo Basile, model 47600). Maximum speed was reached after 245 s. We recorded the latencies at which the animal fell off the rod or removed animals that did not fall off after 300 s. The median latency to fall (untrained mice) was tested five times in a row with an interval of 30 min between trials. Forty-eight hours later, we tested the same mice again five times, and recorded the median latency to fall (trained mice). Statistical analysis. For comparison of normally distributed data, including density of digestion chambers, and electrophysiological measurements of Prnpo/o compared to wild-type mice, we performed unpaired, two-tailed Student’s t-tests after equality of variances was tested by the F-test. In the case of unequal variances (density of digestion chambers in 30-week-old mice), we used unpaired t-test with Welch’s correction. For comparison of JamC-positive areas, we performed a one-way ANOVA followed by Bonferroni’s post-test for multiple comparisons. For statistics on behavioral test results, and on STR analysis, we performed MannWhitney tests. For statistical analysis of fibers with high g-ratio, we performed square root transformation, followed by two-tailed Student’s t-test. For statistics on onion bulb formation, we used two-tailed Fisher’s exact test. P-values were as indicated in the figures. We used SPSS (SPSS Inc.) and Prism software (GraphPad Software) for statistical tests. Numbers following the ± sign represent standard deviation (s.d.) unless otherwise indicated. 43. Manson, J.C. et al. 129/Ola mice carrying a null mutation in PrP that abolishes mRNA production are developmentally normal. Mol. Neurobiol. 8, 121–127 (1994). 44. Mombaerts, P. et al. RAG-1-deficient mice have no mature B and T lymphocytes. Cell 68, 869–877 (1992). 45. Lindeboom, F. et al. A tissue-specific knockout reveals that Gata1 is not essential for Sertoli cell function in the mouse. Nucleic Acids Res. 31, 5405–5412 (2003). 46. Zielasek, J., Martini, R. & Toyka, K.V. Functional abnormalities in P0-deficient mice resemble human hereditary neuropathies linked to P0 gene mutations. Muscle Nerve 19, 946–952 (1996). 47. Bermingham, J.R. Jr. et al. The claw paw mutation reveals a role for Lgi4 in peripheral nerve development. Nat. Neurosci. 9, 76–84 (2006). Report "Axonal prion protein is required for peripheral myelin ... - Nature"